Ever since I went to a culinary school and got my hands on a Vitamix, I have been in love. Obviously, this machine is good at making drinks – that’s why smoothie bars and coffee shops, such as Booster Juice, Jamba Juice, and Starbucks exclusively use Vitamix blenders. But the Vitamix also makes instant ice cream and sorbets, smooth purees, creamy soups, thick dips, crunchy or smooth nut butters, fine DIY flours, sticky dough, dense cake batter, crushed ice – all of it! Some people think that splurging on Vitamix is a luxurious overspend. Why pay more than you have to for a kitchen appliance? Well, because it works. Before owning a Vitamix, I went through four different blenders in seven years. If you’ve ever owned a sub-par blender, you know how frustrating it can be to stop the blending process each time a piece of frozen fruit or a stringy kale gets caught in the blade. How about having to add extra liquid to whatever you’re blending just so the blades don’t create an air pocket, leaving your food unblended and stuck on the sides of the blender jar? I also went through one explosion when I (perhaps stupidly) put a steaming tomato soup into a glass blender jug. The jug burst into pieces within minutes of blending. The tomato soup sprayed all over the ceiling (and the kitchen cabinets, and the microwave, and the stove top, and my brand new shirt, and…). There was nothing wrong with the motor, so I saved it and bought another jug. Well, the motor burnt out a few months later when I attempted to make ice cream. Seeing a smoke coming from the base of a blender is never a good thing. As they say, “buy cheap, buy twice” (in my case, four times!). So, my rule of thumb for home purchases is now the following: if you use something regularly (at least weekly, especially if it’s daily! ), you should always buy quality. I consider my Vitamix an investment because it saves me a lot of money in so many ways. I know that spending a few hundred dollars for a high-speed blender may sound frivolous. But consider how much money some will spend on diet programs, products, shakes, and supplements! Call me crazy, but I think what you really need for healthful living and weight loss is whole plant foods. Ever since owning a Vitamix, I have easily tripled my consumption of vegetables, fruit, and healthy fats. Because the Vitamix blends everything into shop-style smoothies or soups, you end up consuming a lot more vegetables than you normally would. The idea being that you’re much more likely to drink down four large handfuls of kale/spinach/swiss chard than you would be to chew your way through them. Case in point, after I had my baby, I was back into my pre-pregnancy weight in just one month. No dieting, no magical pills, no shakes. Just a lot of veggies and nutrients. That fact alone has made my Vitamix more than worth it. Have you ever noticed that the Vitamix motor power is measured in HP? That’s horse power – yes, the same metric cars use! 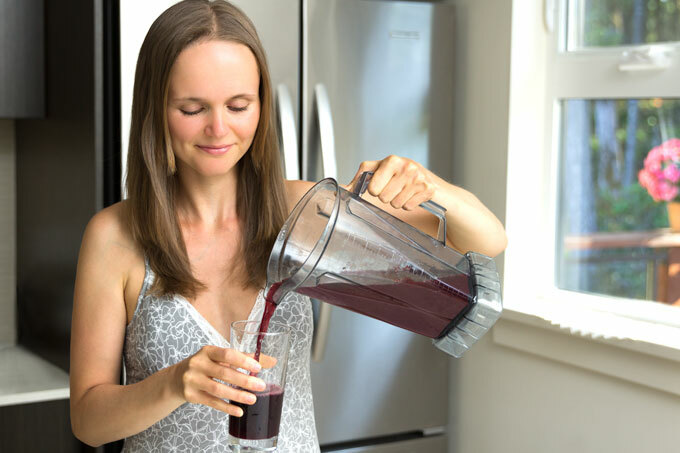 A Vitamix will chop and pulverize the nutrition found in skins and seeds and other unappetizing parts of food into something smooth and drinkable. I often add kale stems, pineapple cores, grapes and apples with seeds, or strawberries with caps into my smoothies and still get no chunks. It works so fast that when you add frozen ingredients into the blender, they have no time to melt. In fact, as you blend, the frozen ingredients refreeze themselves, producing instant ice cream. Dangerous. Maybe I shouldn’t have told you. On the other end of the spectrum, the blades spin so fast that Vitamix can literally heat up your food. I often serve soups straight from the container – no need to reheat. 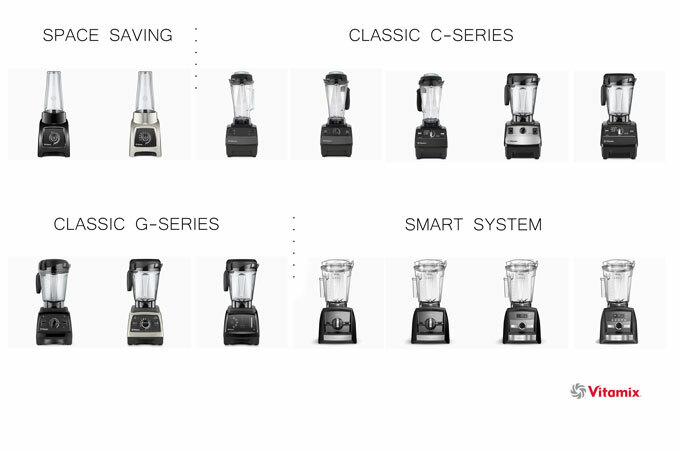 The power and versatility are what makes Vitamix more than just a blender. It’s a blender, a coffee grinder, a grain mill, an ice cream maker, a juicer, and a mixer. It is the most amazing kitchen appliance that I own. Making your own food is one of the most important health decisions you can make. Even people who don’t know how to cook can easily make their own soup and smoothies. But even if it wasn’t critical to your health, I’d still recommend buying a Vitamix blender, because it will quickly pay for itself. Here are just some of the foods that will save you money if you invest in a Vitamix blender. As far as I’m concerned, standard blenders don’t even make smoothies. You can’t compare them to the smoothies that are made by blenders with 2 HP motors. So, in that regard, I’d say a high-speed blender is priceless! Here in Canada, you pay at least $6 for a smoothie. At home, I make smoothies and smoothie bowls for an average of $3. For my husband and I, having smoothies at least every other day is pretty ordinary. I used to make hummus in my food processor but found that unless I peeled the skin off each chickpea, the hummus wouldn’t blend perfectly. Who needs perfectly smooth hummus? Well, my picky daughter does! I would literally spend at least 30 minutes peeling chickpeas whenever I made hummus. Until I found out that I can make silky smooth hummus in my Vitamix without having to peel a single chickpea. Our family easily goes through a large container of hummus every week. As a raw food chef, I use nuts and nut butters all the time. But as you might know, nut butters are expensive! Especially if you want to eat anything other than peanut butter. My husband and I used to joke that buying nut milks will make us bankrupt. Have you ever noticed how expensive nut milks are?! Since I don’t buy regular milk, our family relies on nut milks for breakfast cereal, smoothies, desserts, creamy soups, hot drinks … yes, we go though a lot! I buy whole almonds for $8 per pound. So, 4 cups of almond milk (at 1:4 ratio) costs me $2.54. Pretty close to the store-bought version. If you want your milk creamier, you might be even paying more when you make it yourself. So why bother with homemade then? Well, because you can dehydrate the leftover pulp. I dry the pulp first, then add it to a Vitamix and blend into fine flour. I get about a cup of almond flour from 1 liter of almond milk (depending on how tightly I pack the flour). That’s a lot of savings right there! I love my Cuisinart Ice Cream Maker. The only disadvantage is that it doesn’t make ice cream instantaneously. You can’t just decide to have ice cream like right now. I know, I know. Sometimes you gotta wait for the good things. But do you? Throw some frozen fruit into a Vitamix blender, add a splash of nut milk, and your ice cream is ready in minutes. 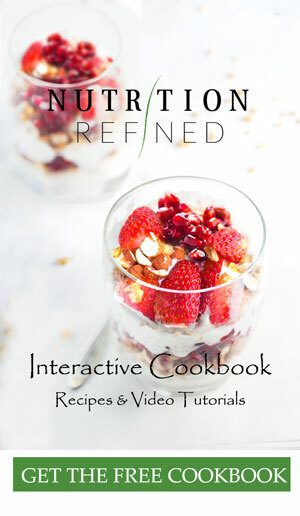 For more complex flavors, you can add nut butters, melted chocolate (that creates beautiful chocolate chunks as it freezes), superfood powders, extracts, some flavored liqueurs (OMG!). If you’re as crazy abut ice cream as my family is, you can easily go through 3 cups of ice cream a week. Getting an expensive blender like a Vitamix is absolutely worth the cost. If you add all the savings, it comes to CAD 3,354/year (USD 2,575)! Yes, you could literally pay off your Vitamix in a few months. At this point, the only question left for you to ask is – which model should I buy? There are really three options when it comes to actually buying a Vitamix: Space Saving, Classic, and Smart System. 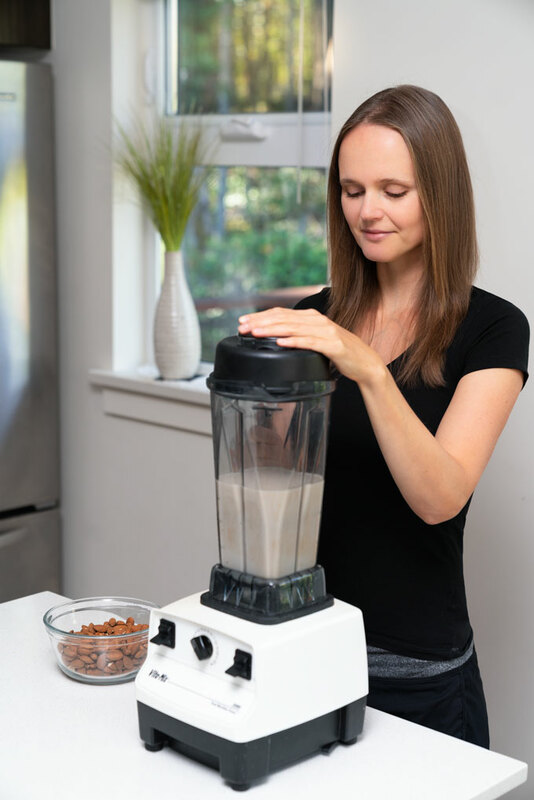 At just over $400 retail, the Space Saving blenders are the cheapest option due to their smaller capacity (1-2 servings) and less powerful motor. The Smart System blenders have the newest technology, some new features, and are designed to be a fully integrated kitchen solution. Really, though, the Classic models are the ones you want to order. The iconic Vitamix 5200 is still my most recommended Vitamix blender model in terms of feature and price. If you’re willing to spend a little bit more for a quieter and better cooling system, I would go with the Vitamix 750. Fine with a reconditioned model? You can get one of those too. They sell for over $100 less and come backed up with a 5-year full warranty. If you need help deciding which model would best suit you, check out this handy blender recommender tool. It’s hard to go wrong here though – whichever model you buy, you’ll love it! *Vitamix is now also having a sale! You can get the Certified Reconditioned Next Generation Vitamix for only 299.95 (regularly it is 499.95!). The sale is on until November 25th, 2018. Thank you for the informative post! I actually made the leap and purchased a Vitamix a few months ago, and love it for all the reasons you talk about! My question is about making soups, now that it’s colder out I’d like to try some recipes but it seems daunting to me. Do you have any tips or tricks for making the soups? Do you use hot water in with vegetables or do you heat it up after? Thanks! First of all, I must say that I love your blog, your YouTube channel and you as human being, I think you’re a very refreshing, pure and genuine soul. This blog article (and the related YT video too) comes just at the right time: my boyfriend and I (I’m a 22 year-old freelancer copywriter from Sardinia) are moving again in Sardinia (we lived in Turin for the past two years) in our brand new house, and I really wanted to take the opportunity to finally purchase a VitaMix (and…finally starting to save money and replicate your amazing recipes!). Three years ago I started my little fat loss journey (now I’m just really passionate about healthy food and creative ways to cook), and I can assure to you that, expecially as a celiac, it has been really difficult to approach the healthy life style. In this regard, I’ve also lost count of the number of blenders I’ve purchased over the past few years, and since I truly love your cooking and your kind of recipes (even before discovering your channel) I think it’s now time to buy a good old VitaMix. I’m hoping that they also ship in Italy (& islands)! Very inspiring blog and more importantly truly and easily healthy. I have recently found your YouTube videos. I love them. I am wanting to go raw, but it seems so over whelming to me. My family wants nothing to do with it. I don’t know where to start. I would like it to taste good. I love your recipes and am thankful that you share them so kindly. I’ve been interested for a while in buying a Vitamix blender. I just wanted to understand better what does a recinditioned Viyamix mean? That it is a second hand machine that was used by some one else? If so, does in mean that the jar was also belonged to some one else or just the part of the motor? (I’m asking because of kosher reasons). I am personally using Vitamix and pretty satisfied with them. A happy user!! Thank you so much, Shihab! I bought my first blender after reading your post and it helped me a lot to pick the best one. Thanks a lot!